Sometimes a genre choice can turn a downtrodden and repetitive story into a memorable and fascinating movie, like 1945’s “Mildred Pierce.” When I first heard the premise of this movie – the tale of a recently divorced mother (Joan Crawford) working her fingers to the bone so that her ungrateful, spoiled daughter (Ann Blyth) can live a luxurious lifestyle – I was reminded of “Imitation of Life” and the often unrecognized soap-opera-like struggle that Lana Turner’s character goes through. 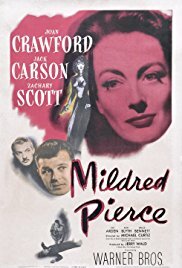 But much to my surprise, “Mildred Pierce” turned all of that on its head by presenting its story as a film noir or thriller. Instead of the mother’s fight for her daughter’s approval turning into a predictable tragedy, it turns into a mystery fueled by greed, jealousy and a lust for more power and control. Since the film opens up with the murder of man in Mildred’s beach house, that sinister feeling is always lurking throughout this movie, even when she has the best intentions. There’s always an air of uncertainty to every action the titular character takes, whether she’s really doing all of this for her daughter or if she has other selfish motives, like the sleazy men she keeps around that somehow keep back stabbing her at her most vulnerable moments. Yet, at the same time, there’s charm and class throughout this film, as Joan Crawford masterfully plays the role of a hardworking mother who wants to earn the respect of everyone, even those who she has no reason to like. 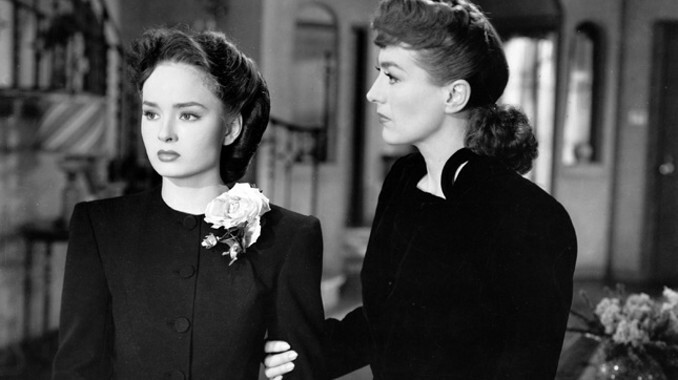 At the center though, “Mildred Pierce” is about a family love that has been twisted out of shape so much that both mother and daughter have forgotten what love really looks like. Both characters are so caught up in their worlds, one of hard work and another of high class society living, that they can’t see beyond that and will do whatever it takes to get the other to see it their way, inadvertently driving both further away from one another. They both feel that love is something that can be found in a store and has a price tag, which makes the tragedy of their honest actions even more heartbreaking. Overall, “Mildred Pierce” is much better than I expected it to be. I went in thinking it would be similar to “Dark Victory” or “Jezebel” with more emphasis on family, and instead I got a gripping film noir about a hard working woman’s life turning into something bitter. There is some stellar acting from Crawford and Ann Blyth, both selling every greedy and selfish turn masterfully. There is never a boring moment in “Mildred Pierce,” which is very strange for me to say.